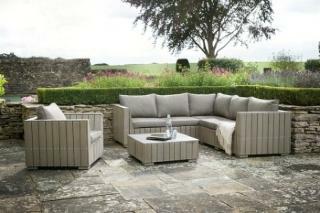 Named after Bosham, a sailing village in West Sussex, the stunning Bosham Corner Sofa Set has a wonderful driftwood chic that would certainly turn heads in any garden. Perfect for the patio or terrace, this modular set allows you to create the outdoor seating you desire with units that come together to create an L shaped corner sofa, an armchair and coffee table. Fashioned from polywood, a timber-styled material that is made from recycled plastic, the Bosham Corner Sofa Set has some serious impressive credentials when it comes to using recycled materials and the polywood manufacture makes this set completely weatherproof too. Finished with gorgeous showerproof, linen look cushions in soothing soft grey, the Bosham Corner Sofa Set makes any outdoor space look incredibly inviting - perfect for long summer evenings and a spot of entertaining.